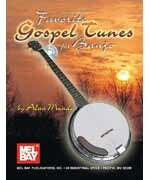 Alan Munde, one of the most respected contemporary banjo players, couples his deep understanding of the banjo with 17 of America's best loved gospel songs. Ranging from the driving sound of bluegrass banjo to the rich chordal harmonies unique to his playing, these arrangements bring out the fullness and sparkle of these great old songs. Every banjo player needs a wide variety of tunes in the repertoire to cover all the performance occasions. Gospel tunes are always in demand. These all new professional settings for the great old classis will get the attention of any audience. Included are the rousing renditions of "Swing Low, Sweet Chariot," "Old Time Religion" (arranged in three keys), "Somebody Touched Me," and many more. There is the soul stirring arrangement of "Wayfaring Stranger," and the chord versions of the slow thoughtful numbers "Old Rugged Cross," "Nearer My God to Thee," "What a Friend We Have in Jesus."